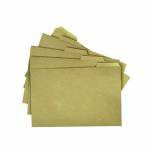 Q-Connect Kraft Square Cut Folder 170gsm Foolscap Buff (Pack of 100) KF23025 Pack of 1 Q-Connect Square Cut Folders. 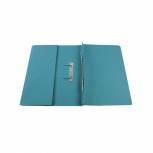 Lightweight filing folders pre-creased to accommodate large quantities of paper and fit neatly into suspension files. Foolscap Kraftliner - Buff. 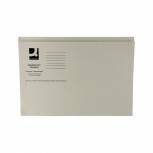 Q-Connect Square Cut Folder Lightweight 180gsm Foolscap Buff (Pack of 100) KF26032 Pack of 1 Q-Connect Square Cut Folders. Pre-creased folders manufactured from 180gsm manilla, ideal for storing large quantities of paper. Features include a large labelling area and pre-punched slits to accommodate standard filing clips. Foolscap - Buff. 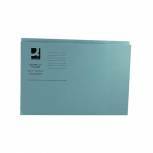 Q-Connect Square Cut Folder Mediumweight 250gsm Foolscap Blue (Pack of 100) KF01191 Pack of 1 Q-Connect Square Cut Folders. Pre-creased folders manufactured from 270gsm manilla, ideal for storing large quantities of paper. Features include a large labelling area and pre-punched slits to accommodate standard filing clips. Foolscap - Blue. 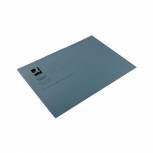 Q-Connect Square Cut Folder Mediumweight 250gsm Foolscap Buff (Pack of 100) KF01190 Pack of 1 Q-Connect Square Cut Folders. Pre-creased folders manufactured from 270gsm manilla, ideal for storing large quantities of paper. Features include a large labelling area and pre-punched slits to accommodate standard filing clips. Foolscap - Buff. Q-Connect Square Cut Folder Lightweight 180gsm Foolscap Blue (Pack of 100) KF26033 Pack of 1 Q-Connect Square Cut Folders. Pre-creased folders manufactured from 180gsm manilla, ideal for storing large quantities of paper. Features include a large labelling area and pre-punched slits to accommodate standard filing clips. Foolscap - Blue. 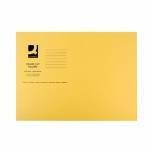 Q-Connect Square Cut Folder Lightweight 180gsm Foolscap Yellow (Pack of 100) KF26027 Pack of 1 Q-Connect Square Cut Folders. Pre-creased folders manufactured from 180gsm manilla, ideal for storing large quantities of paper. Features include a large labelling area and pre-punched slits to accommodate standard filing clips. Foolscap - Yellow. 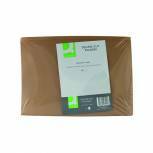 Q-Connect Transfer File 35mm Capacity Foolscap Buff (Pack of 25) KF26062 Pack of 25 Q-Connect Transfer Files. Manufactured from 300gsm manilla and fitted with a spring mechanism allowing easy and quick insertion and removal of papers anywhere in the file. Suitable for both A4 and foolscap papers. Capacity 35mm. Colour - Buff. 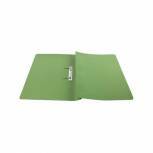 Q-Connect Square Cut Folder Lightweight 180gsm Foolscap Green (Pack of 100) KF26031 Pack of 1 Q-Connect Square Cut Folders. Pre-creased folders manufactured from 180gsm manilla, ideal for storing large quantities of paper. Features include a large labelling area and pre-punched slits to accommodate standard filing clips. Foolscap - Green. 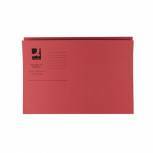 Q-Connect Square Cut Folder Mediumweight 250gsm Foolscap Red (Pack of 100) KF01186 Pack of 1 Q-Connect Square Cut Folders. Pre-creased folders manufactured from 270gsm manilla, ideal for storing large quantities of paper. Features include a large labelling area and pre-punched slits to accommodate standard filing clips. Foolscap - Red. 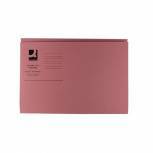 Q-Connect Transfer File 35mm Capacity Foolscap Pink (Pack of 25) KF26058 Pack of 25 Q-Connect Transfer Files. Manufactured from 300gsm manilla and fitted with a spring mechanism allowing easy and quick insertion and removal of papers anywhere in the file. Suitable for both A4 and foolscap papers. Capacity 35mm. Colour - Pink. Q-Connect Transfer File 35mm Capacity Foolscap Green (Pack of 25) KF26060 Pack of 25 Q-Connect Transfer Files. Manufactured from 300gsm manilla and fitted with a spring mechanism allowing easy and quick insertion and removal of papers anywhere in the file. Suitable for both A4 and foolscap papers. Capacity 35mm. Colour - Green. 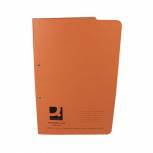 Q-Connect Transfer File 35mm Capacity Foolscap Orange (Pack of 25) KF26059 Pack of 25 Q-Connect Transfer Files. Manufactured from 300gsm manilla and fitted with a spring mechanism allowing easy and quick insertion and removal of papers anywhere in the file. Suitable for both A4 and foolscap papers. Capacity 35mm. Colour - Orange. 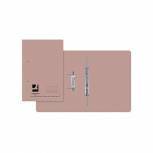 Q-Connect Square Cut Folder Mediumweight 250gsm Foolscap Pink (Pack of 100) KF01187 Pack of 1 Q-Connect Square Cut Folders. Pre-creased folders manufactured from 270gsm manilla, ideal for storing large quantities of paper. Features include a large labelling area and pre-punched slits to accommodate standard filing clips. 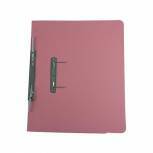 Foolscap - Pink. 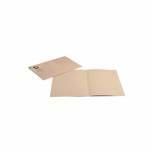 Q-Connect Kraft Tabbed Folder 170gsm Foolscap Buff (Pack of 100) KF01578 Pack of 100 Q-Connect Tabbed Folders. Manufactured from quality recycled kraft manilla, tabbed in five positions with a printed identification panel. Foolscap. Colour - Buff. 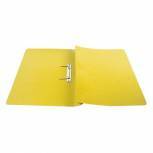 Q-Connect Transfer File 35mm Capacity Foolscap Yellow (Pack of 25) KF26057 Pack of 25 Q-Connect Transfer Files. Manufactured from 300gsm manilla and fitted with a spring mechanism allowing easy and quick insertion and removal of papers anywhere in the file. Suitable for both A4 and foolscap papers. Capacity 35mm. Colour - Yellow. 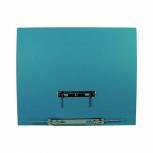 Q-Connect Transfer Pocket 35mm Capacity Foolscap File Blue (Pack of 25) KF26094 Pack of 25 Transfer files with a useful pocket for loose papers. Can be colour matched to the existing Q transfer files for a co-ordinated filing system. Pocket is on right hand side making it suitable for both normal use and legal use. 300gm 35mm capacity. Blue. Q-Connect Square Cut Folder Mediumweight 250gsm Foolscap Green (Pack of 100) KF01189 Pack of 1 Q-Connect Square Cut Folders. Pre-creased folders manufactured from 270gsm manilla, ideal for storing large quantities of paper. Features include a large labelling area and pre-punched slits to accommodate standard filing clips. Foolscap - Green. 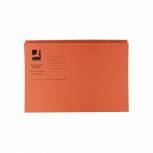 Q-Connect Square Cut Folder Mediumweight 250gsm Foolscap Orange (Pack of 100) KF01188 Pack of 1 Q-Connect Square Cut Folders. Pre-creased folders manufactured from 270gsm manilla, ideal for storing large quantities of paper. Features include a large labelling area and pre-punched slits to accommodate standard filing clips. Foolscap - Orange. 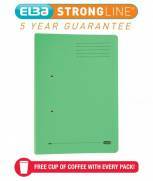 Elba Stratford Spring Pocket File 320gsm Foolscap Green (Pack of 25) 100090147 Pack of 25 Heavyweight manilla file features transfer prongs corresponding coil springs and compressor bar for sorting. Deep pocket on inside back cover enables loose items to be kept together with file. Capacity 32mm. Foolscap Green.